- Autonomy November 25, 1897 Supreme Authority and Sovereignty was retained by the Kingdom of Spain. Puerto Rico, also known as the Commonwealth of Puerto Rico, is a territory or colony of the United States in the Caribbean Sea. It has almost 4 million (4,000,000) people. It is the 169th largest sized country in the world in amount of land. Its political system is based on a republican system. It has two languages: Spanish and English. The currency (money) used is the United States dollar. Puerto Rico means "rich port" in Spanish. 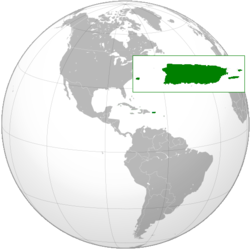 The Commonwealth of Puerto Rico includes the largest, main island and a number of smaller islands, including Mona, Vieques, and Culebra. Of those three smaller islands, only Culebra and Vieques are populated all year. Mona is unpopulated, but employees of the Puerto Rico Department of Natural Resources sometimes visit the island to inspect it and its wildlife. People can visit the island for hiking and camping by getting the permission needed. San Juan, on the northern side of the main island, is the island's largest city and the capital of the territory. The history of Puerto Rico began when the Ortoiroid people started living in the island between 3000 and 2000 BC. Other tribes, for example the Saladoid and Arawak Indians, lived in the island between 430 BC and 1000 AD. When Christopher Columbus discovered the island in the New World in 1492 and named it San Juan Bautista, the people living there were the Taínos. Since it is in the northeastern Caribbean Sea, Puerto Rico formed an important part of the Spanish Empire from the early years of the exploration, conquest, and colonization of the New World. The island was a major military post during many wars between Spain and other European countries for control of the region in the 16th, 17th and 18th centuries. In 1898, during the Spanish-American war, Puerto Rico was invaded and became a possession of the United States. During the 20th century, Puerto Rico's political status changed from time to time. The Foraker Act of 1900 created a civil government to replace the military government made after the Spanish–American war, and the Jones Act of 1917 gave Puerto Rican people United States citizenship. Afterwards, in 1952, the drafting of Puerto Rico's own Constitution and democratic elections were established. The political status of Puerto Rico, a Commonwealth controlled by the United States, is still not completely defined. Many people want to resolve this status, while others want the status to remain the same. Of the people who want to change the status, some want Puerto Rico to become a new U.S. state, while others want Puerto Rico to become a fully independent country. Puerto Rico has three main political parties: the Puerto Rican Independence Party, which favors Puerto Rico becoming an independent nation; the New Progressive Party, which supports Puerto Rico's transition to becoming a state of the U.S; and the Popular Democratic Party, which supports Colonialism. The issue of the political status of the island (meaning whether it's a country, a U.S state, or a colony) is an issue of debate amongst the Puerto Rican people. In the past there have been many attempts to clearly define the island's political status by means of voting. Most of the time the majority of the people have chosen to remain a colony. However in the last "status voting" the colonial option appeared to have lost well over 90% of its support, while the U.S state option has only gained strength in the last few decades. The Puerto Rican Independence party, on the other hand, has mainly lost a great deal of support within the last six decades. Puerto Rico is said to comprise a White majority, an extinct Amerindian population, persons of mixed ancestry, Africans and a small Asian minority. Recent genetic research, however, contradicts that information. According to the 2010 US Census, 99% of the population consider themselves of Puerto Rican descent (regardless of race or skin color), making Puerto Rico one of the most culturally unified societies in the world. This article has text from the English Wikipedia articles Puerto Rico and History of Puerto Rico. ↑ "U.S. Department of State. Dependencies and Areas of Special Sovereignty". State.gov. http://www.state.gov/s/inr/rls/10543.htm. Retrieved August 14, 2010. ↑ "Carta Autonómica de 1897 de Puerto Rico". Lexjuris.com. http://www.lexjuris.com/lexlex/lexotras/lexcartaautonomica.htm. Retrieved 2011-10-30. ↑ "Annual Estimates of the Population for the United States, Regions, States, and Puerto Rico: April 1, 2010 to July 1, 2012" (CSV). 2012 Population Estimates. United States Census Bureau, Population Division. December 2012. http://www.census.gov/popest/data/national/totals/2012/index.html. Retrieved December 24, 2012. ↑ 5.0 5.1 "Government Development Bank of Puerto Rico, May 2011". gdb-pur.com. http://www.gdb-pur.com/economy/documents/2011-05-16-AETabla1-2010.pdf. Retrieved June 2, 2011. ↑ "The second voyage of Columbus". World Book, Inc.. http://www.worldbook.com/wc/popup?path=features/explorers&page=html/newworld_chris_second.html&direct=yes. Retrieved 2006-2-11. ↑ Mahaffy, Cheryl (January 28, 2006). "Vieques Island - What lies beneath". Edmonton Journal. http://www.canada.com/edmontonjournal/news/travel/story.html?id=eb3c0119-8328-4b52-96ed-4a63763160f7. Retrieved 2006-2-11. ↑ Rouse, Irving. The Tainos : Rise and Decline of the People Who Greeted Columbus ISBN 0-300-05696-6. This page was last changed on 2 August 2014, at 16:47.